Engle Homes in Southwest Florida was looking for a unique campaign to sell an unusually high number of homes in an unusually short period of time. It was First Quarter 2007 — a time when the real estate market in general nationally was experiencing a major downturn in sales. The agency planned and executed the 50 Homes in 5 Days campaign. Just as the name says, the goal was to garner contracts for 50 homes in less than a week. We developed an eye-popping look and feel for the marketing materials, including a specialized logo that incorporated the name of the campaign. Our marketing communications took full advantage of all channels: print, TV, radio, outdoor, direct mail, e-mail and online, along with a full-court public relations campaign. We also created other pieces to be used in ways not normally seen, such as door wraps. The campaign caught the attention of homebuyers and those who had been fence-sitting, waiting for the right time to buy. The first five days were so popular that Engle Homes decided to extend the offer for the following weekend. Contracts were signed for more than 70 homes. The campaign not only gave Engle Homes a top-of-mind awareness during an unusual real estate market, but also gave confidence to the public that the builder was on solid footing and was not being affected as badly as some of its competitors. Plus, an unexpected and flattering outcome was to see other national builders use the 50 Homes in 5 Days basic concept to create similar campaigns for their communities in the area. As the real estate market took a downturn in 2007, there was a perception that many potential homebuyers were “sitting on the fence” waiting for the market to bottom out. 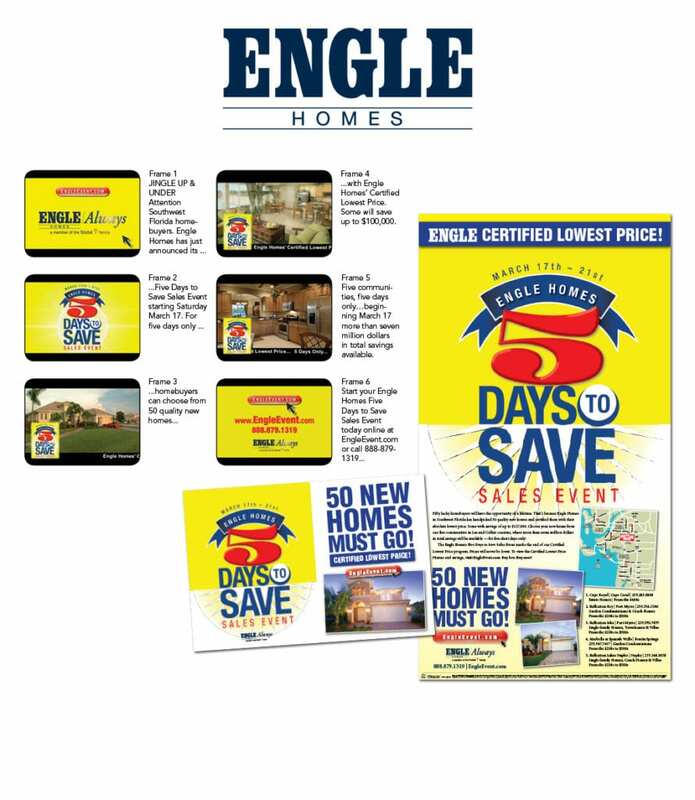 In the summer, our client, Engle Homes, decided a new marketing campaign was needed to help stimulate sales. The campaign would begin in the fall of 2007 with the primary objective of informing homebuyers that Engle’s homes were available at the lowest home prices ever — prices that would soon come to an end. The campaign should include print ads, TV, radio, electronic direct marketing and outdoor, and would need to run through the end of the year. The idea was to create a steady buzz that would lead to sales of a limited supply of move-in-ready homes in seven gated communities in two counties. 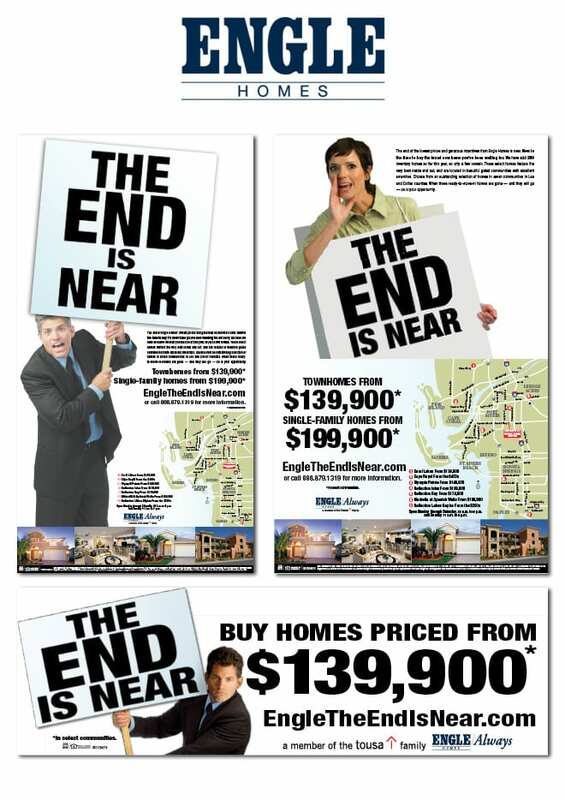 The Agency decided a very direct approach would be best, and created “The End is Near.” The campaign centered on “The End is Near” sandwich board type of visual — an instantly recognizable theme. A full marketing campaign encouraging homebuyers to buy a home with up to $100,000 in savings was developed in a short time, and deployed across all channels. Bargain-hunters could choose from ready-to-move-in single-family homes, villas and town homes in communities close to the area’s best destinations and attractions. Plus, exciting community amenities, including clubhouses, resort-style pools and fitness centers. Act now before “The End” is actually here. Following the success of a late-winter promotional campaign targeted to seasonal residents and visitors, the Agency turned its attention toward devising a campaign that would target local buyers. This campaign would build on the momentum created by the late-winter promotional. Many would-be buyers were still “sitting on the fence” waiting for home prices to decrease, so the campaign would highlight Engle Homes’ best prices ever. Also, this would be a short-term campaign, one month only. The Agency devised the “Spring Fling” campaign, reflecting the time of year for renewal and refreshing that the public relates to very easily. 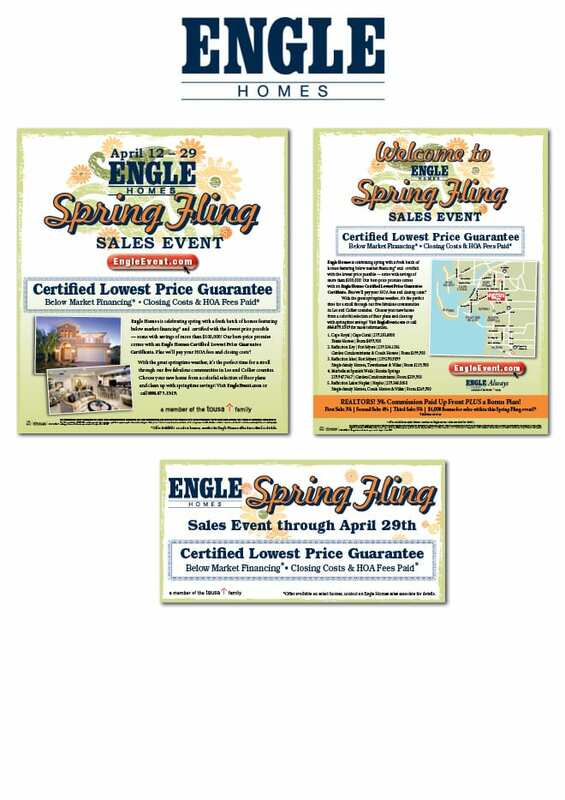 The campaign focused on Engle Homes’ Certified Lowest Price Guarantee, encouraging “fence sitters” to act immediately for the best prices ever. Other incentives were touted as was the fact that some homes could be purchased for $100,000 less than previously listed. The campaign was executed over multiple channels: broadcast, print, direct mail, e-mail, a Web page and fleet graphics. This was a short-term campaign, just 30 days, which included a pre-marketing push of two weeks followed by a two-week blitz. Spring Fling was successful. All sales goals for April and May were achieved. Plus, Spring Fling continued the momentum that Engle Homes had before the campaign, which was critical as the Agency then capitalized on a subsequent longer-term campaign through summer and early fall.